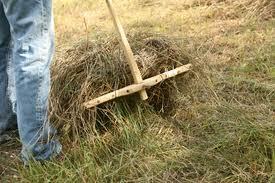 Posted on July 20, 2012, in Uncategorized and tagged alfalfa, clover, fiber, grass, harvest, hay, health, herbs, orchard, rake, scythe, sickle, timothy. Bookmark the permalink. 6 Comments. Hay is important for rabbits – here’s some thoughts from RiseAndShineRabbitry in their blog on the topic! Ben got me hooked on scythes!